All my life I dabbled in art. My dream growing up was to be in advertising, which didn’t pan out. Unfortunately, after I graduated high school and had my daughter, I never picked up paper and pencil to draw (but I can tell you that my daughter inherited my artistic skills and is an amazing self-proclaimed artist for which I am thankful). It wasn’t until many years later when a friend invited me to a one-time beading class that I was hooked. I’m not sure if it was all the sparkly beads that attracted me or the idea of creating something with my own hands that I fell in love with. I spent a couple of years beading jewelry as a hobby and giving the pieces to friends and family. 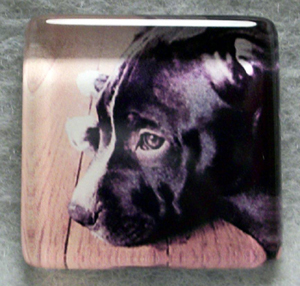 I happened upon a website one day that showed how to make glass tile charms using your own personal photos, and it sparked my interest. I spent a great deal of time researching the “how-to’s” of creating these little masterpieces, only to fail miserably. So, I began to experiment my own way, and even though it took me two years to perfect it, I now know how to make my charms beautifully. I am always learning and trying new things to make improvements, and it’s a lot of fun. I am currently working with various sizes and types of glass tiles, including glass paperweights and coasters. Eventually I want to incorporate beading into my charms as well. Growing up I had always had a dog and at least one cat. I was told that I have a way with animals, and every one I meet seems to love my company. Even my landlords insist their dogs love me more than they love them! Over the past few years I have had many animals and, of course, I have lost many too. Twelve years ago I rescued two Arabian horses from a terrible situation. When I lost one of them and then not long after lost my beloved Sheltie, I felt like I had to do something to help some way or give something back. I started volunteering at our local no-kill animal shelter, and soon they offered me a full-time job. It was a dream come true! I loved the job with all I had and put the animals before anything else. I gave up my previous job after 16 years and knew I had found my calling. Unfortunately the shelter job didn’t last long, and I left the shelter on my own and unemployed. Currently I still have one of my horses, now 39 years old. I have four cats, a Chihuahua, my rescued Labrador/Rottweiler mix and two adopted Guinea Pigs. If I could have more, I certainly would! It wasn’t until I joined Facebook many years ago that I became aware of the needs of so many animals in the world, with so many unwanted and abused in shelters, and I felt I had to do something. I had given a couple of my charms featuring her pets to a new friend, and she suggested I start my own website because she was so impressed. After thinking about it, I decided to do just that and started a page on Facebook. I was already involved in cross-posting and networking animals in need, and that seemed to bring a lot of traffic to my charm page as well. Rescues wanted to know about what I do and if I would be interested in donating a charm or two passing on my info in return. This brought more people to me with many orders. So I was not only helping out with the animals in my own way, but it was in turn helping to promote what I do and bring me customers. 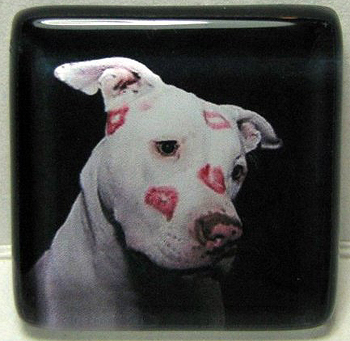 Although I do not have a pit bull, I know that someday I will, and I do have a passion for them. The bad rap they get is so unfair, and I feel they need all the help they can get. It wasn’t my intention to concentrate on pit bulls, it just seemed to fall into place, and many of the rescues that I help are pit bull rescues. I came across StubbyDog on Facebook one day and fell in love with their page and their logo. I knew it would make a great charm, so I reached out to offer charms using the logo. 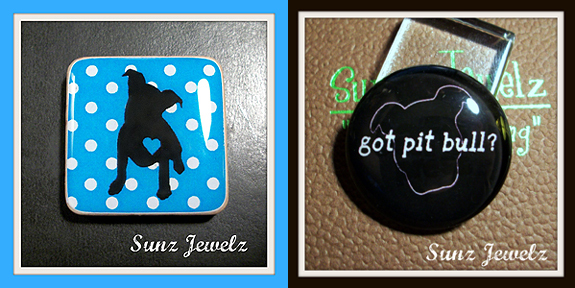 This opened the door for me to learn of Enzo and his foster mom, and I felt had to create an Enzo charm (photo right) to show my appreciation for what she did to save this pit bull’s life. I love to give, and I love to put a smile on the faces of others, especially during difficult times. I have so much fun creating different and unique charms that all have their own story. But I think what inspires me to give a charm to the least expecting people is that so many will have one of my charms of their pet that has passed away. I cannot tell you how many people tell me that the charms heal them, making them feel as if having the charm close to their heart keeps their pet just as close. They feel comforted. I do have a charm for my Sheltie that passed away three years ago, and it does help me when I am having an off day. It kind of keeps me going and gives me a sense of her presence. 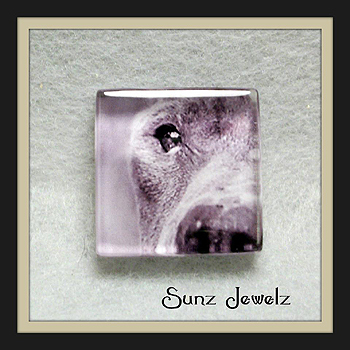 I have gone out of my way to create charms for some who recently lost a pet. They have no idea why I do this, but when they receive their charm as a surprise, many tell me it makes them smile – as well as cry. Although Enzo is still very much alive, Allison lost a part of him due to her generous heart. What she did to save his life made me feel there is more hope out there for other pit bulls. This prompted me to reach out and find out the identity of Enzo’s foster mom so I could create a charm for her. I know it will put a smile on her face, and I hope it will comfort her. This is my thanks to her for what she did, and it makes me feel good knowing I can give her a little piece of Enzo to hold close. This is my new passion, and although I can’t help all the animals out there, I can help one at a time and make a difference in that dog’s life. I am so thankful for where I am now and what I do, and for all the people I have met and come to know through my work. Without them I would not be where I am today or be able to help those that need it. This is my dream job now! Dawn’s work is absolutely stunning. Thanks to her, Enzo is always close to my heart.